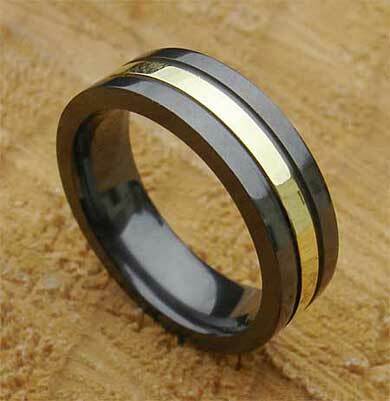 Men's Silver Inlay Black Wedding Ring : LOVE2HAVE in the UK! 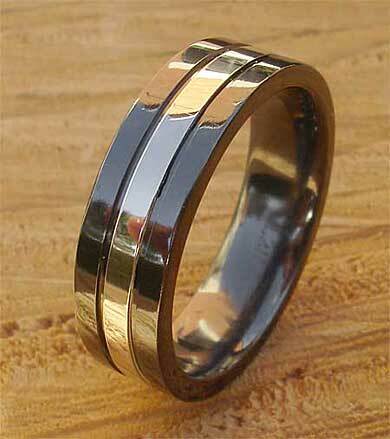 A men's wedding ring in black with a silver inlay. Metals such as zirconium can be mixed, and rings are often inlaid with precious metals such as silver to create two tone wedding rings, this ring being one such example. 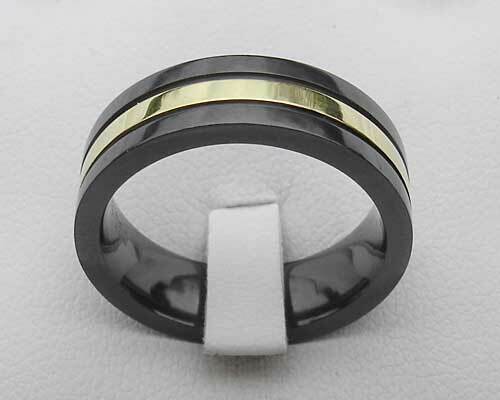 Here we have a 7mm width flat profile zirconium men's wedding ring with a sterling silver inlay and grooves. The design has quite a pronounced feel to it with two bold grooves that sit either side of the silver. The ring also appears quite chunky, being squared off on the edges, so therefore it is very suitable for a man. Additionally, a 9ct yellow gold inlay is also available, so please email us for details for the price. We can also provide this model in various widths also which are available for both him and her. Metal(s)/Material(s) Available: Zirconium and silver.